"Anybody can add water to a boxed pancake mix, but you're better than that! 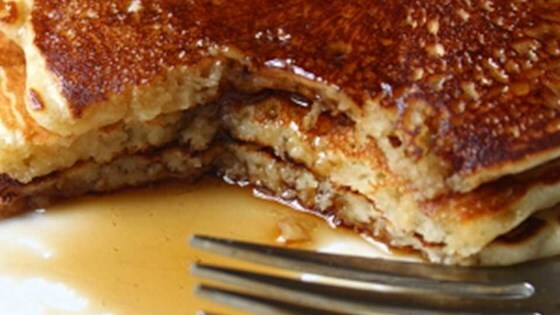 These pancakes are not too thick, not too thin, but tender, light, buttery, and delicious." Sift together flour, baking powder, salt, and sugar in a large bowl. Whisk in melted butter, egg, and milk until combined. Let batter rest for 5 minutes. Preheat a large skillet over medium-high heat. Spray with cooking spray. Pour batter into the hot skillet, about 1/4 cup of batter for each pancake. Cook for 2 to 3 minutes, until bubbles appear on the sides and center of each pancake. Flip and cook until golden, about 1 to 2 minutes. See how to make one of our top 5 most popular recipes! I followed this recipe exactly and found the pancakes to be salty. I checked and rechecked to make sure it was not a mistake on my part. Maybe unsalted butter next time? These are really nice a fluffy. They puff up so beautifully. So easy to make too. I made the recipe as written but next time I might add a teaspoon of vanilla. Enjoy! Perfect pancakes – light and fluffy. I used half the amount of salt (my usual habit) and added blueberries (another habit) for a great morning breakfast.